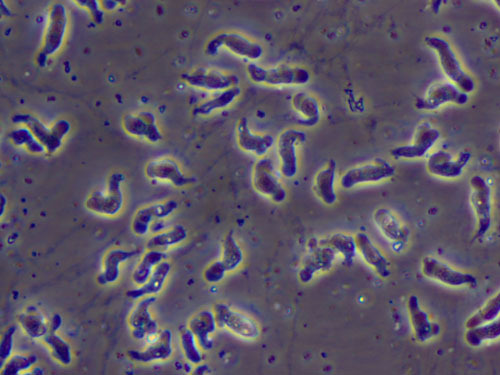 Naegleria fowleri is a protozoan that has a fascinating form and function. N. fowleri’s form changes and reacts to different environments. This species also has movement and ways to identify what stage of the life cycle it is in. All of these unique factors about N. fowleri all make up this organism. First is the life cycle of N. fowleri which has three different stages the organism goes through (Martinez and Govinda 2003). The first stage of the linages life cycle is a feeding trophozoite stage which is kn own as the amoeba stage (Martinez and Govinda 2003). The second stage of the lineages life cycle is a transient flagellate stage which is known as the flagellate stage (Martinez and Govinda 2003). The third stage of the linages life cycle is a resistant cyst stage which is known as the cyst stage (Martinez and Govinda 2003). Slime molds are organisms that also turn into cysts when the environment conditions are not favorable. Each of the N. fowleri stages has a single nucleus (Martinez and Govinda 2003). The nucleus is normally round and has a thick nucleolus within the organism (Martinez and Govinda 2003). The cyst stage in this species has a wall with one or more flat pores along it and the cyst usually has a round shape (Martinez and Govinda 2003). N. fowleri reproduces by binary fission which is a form of asexual reproduction when one cell divides into two cells (Martinez 1996). Another organism that does asexual reproduction is the water flea. This species can only reproduce in the trophozoite stage and cannot reproduce in the cyst or flagellate stages (Martinez 1996). Since N. fowleri prefer to inhabit warm water, this species reproduces more efficiently when in warmer water temperatures too (Martinez 1996). N. fowleri’s life cycle and reproduction are not all that confusing and are pretty simple to understand (Martinez 1996). Secondly N. fowleri is about the organism’s structures and how they function in different situations (Martinez and Govinda 2003). When N. fowleri is under certain conditions the organism goes from trophozoite stage into a flagellated stage (Martinez and Govinda 2003). Then when this species is in negative conditions it goes from trophozoite stage into the cyst stage (Martinez and Govinda 2003). When Naegleria fowleri is in conditions where the organism is a cyst it goes down to the bottom of lakes, rivers, and swimming pools till the bad conditions are gone (Martinez and Govinda 2003). Also scientists found out when this organism is in distilled water N. fowleri turn into the flagellate stage. When this species is in the trophozoite phase the species will change the shape and size of the body frequently and is considered a free living amoeba (Martinez and Govinda 2003). The cytoplasm of this lineage is granular and contains a great deal of vacuoles within the cytoplasm, it also contains a nucleus (Martinez and Govinda 2003). The way N. fowleri reacts to environment stimuli and how the organism’s structures change is remarkable (Martinez and Govinda 2003). Lastly the N. fowleri’s movement and how to identify this species is very interesting too. This species moves in a slug-like motion (Schuster 2002) and when N. fowleri is in the trophozoite stage it uses lobopodia to move around (Martinez 1996). At the anterior end of the N. fowleri in the trophozoite stage there is a pseudopod to help identify which stage the N. fowleri is in (Schuster 2002). When this species is in flagellate form N. fowleri have two flagella at the front of the flagellate (Schuster 2002). In conclusion N. fowleri can go into three different stages or forms. This species reproduces by binary fission and reproduces better in warmer temperatures. The certain conditions of an environment are what determine which stage the organism will be in. The movement of N. fowleri is in the trophozoite stage this can be identified by the presence of flagella or pseudopods.